One of the bright spots of Winter is the return of figure skating on television. It is young men wearing wonderfully revealing raiments, artistically gliding across the ice accompanied by the sonorous strains of beautiful music. It is a time for the spotlight to be shined on sumptuous overly developed thighs and buttocks. It is a time to once again see reigning U.S. Mens champion Evan Lysacek. I've been impressed with Evan Lysacek since the 2006 Winter Olympics in Torino. There he triumphed over severe illness and a bad performance in the short program to place third in the free and fourth overall. He's got great character and quiet dignity. His skating is not always as steady as his enduring willingness to do his best, but his good nature makes him a winner every time. NBC showed the Men's Free Program of the U.S. Figure Skating Championships, featuring Evan, on a Sunday night in prime time, which is pretty good for this kind of thing. I think it is more a result of the current writers strike than a change in network TV's usual sidelining of men's artistic sports. Unfortunately, the viewing audience was also forced to see the vermin Johnny Weir. 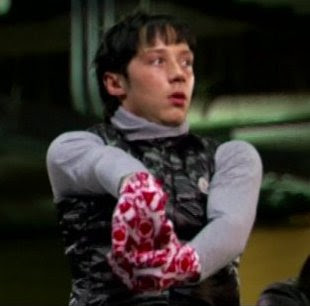 I used to be a supporter of Johnny Weir, but his attitude and even his appearance are just disgusting. At the start of the show he mentioned being referred to as a princess, which is ludicrous since that would imply some regalness, while Johnny Weir is all trash. He trash talked Evan Lysacek, saying that could never have been friends in real life. That's true - Evan Lysacek would have been with the cool kids while Johnny Weir would have been the kid every one beat up and from whom everyone stole their lunch money. He also said that he was not a religious person, which is good since then I know he won't be offended when I tell him to go to Hell. Evan Lysacek's Greek Orthodox faith worked out pretty good for him in the competition, since he won the free program and that gave him the championship when he tied Johnny Weir on the overall score. It's sad that someone like Johnny Weir is so undeniably talented. The problem is all in his attitude. He needs to study Evan Lysacek to see how a champion should behave. When given the opportunity, Evan complimented Johnny and said nothing bad about him. In the end, they both did superior jobs, but Evan is who I would rather be my nation's champion. Kudos to Ryan Bradley and Stephen Carriere for a job well done. Both are kind of cute in their own way.